A late winter storm dropped up to 7 inches of sleet and snow overnight Wednesday, leading to more than 800 school closings and delays and nearly as many flight cancellations Thursday. North Texas' most recent Winter Storm Warning expired at noon Thursday after a record snowfall overnight. The precipitation first coated roads in ice and then covered it with several inches of snow, making driving hazardous in the early morning. Temperatures were expected to creep above the freezing point by noon and remain there for several hours, NBC 5 Meteorologist Grant Johnston said. Though all of the snow is not expected to melt Thursday, with warmer temperatures and sunny skies, road conditions are expected to improve significantly throughout the day. By 11:30 a.m., snow that once covered many highways had melted and left only a wet roadway behind. Drivers are urged to continue to use caution as occasional patches of ice remain. 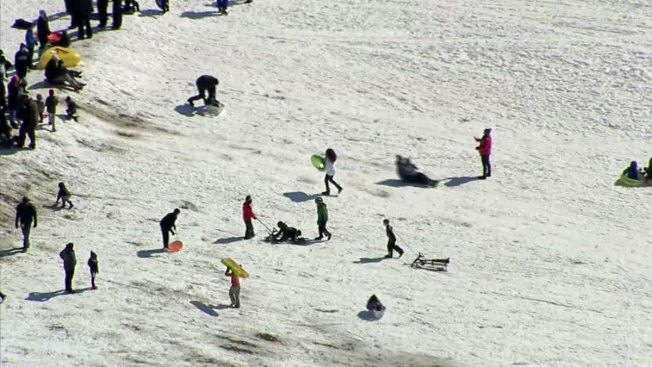 After a record snowfall, Reporter Ellen Bryan had the enviable job of showing North Texans how to have fun in the snow. Side roads and secondary roads are expected to remain slushy. Any slush left on the road after dusk is expected to refreeze. Meanwhile, crews from the Texas Department of Transportation said they'll work as quickly as possible to remove all snow and ice from the roads so that it can't refreeze overnight Thursday. The weekend forecast looks mostly sunny and with milder conditions. Many North Texans with the day off from school and work headed outside to take advantage of the rare opportunity to play in the snow. 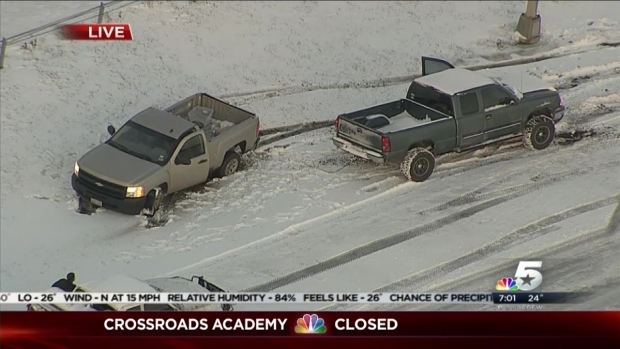 Photos shared with NBC 5 are below. 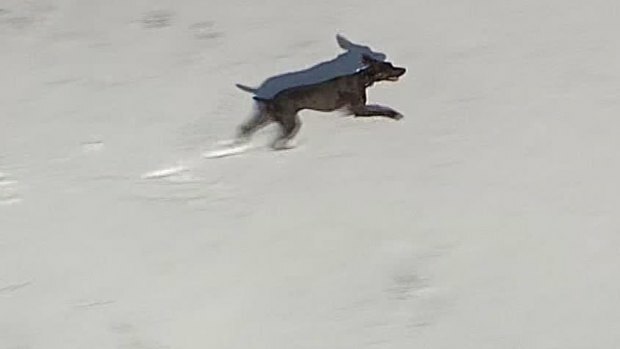 NBC DFW's Chopper 5 shot video of a dog having a blast in the snow at Flagpole Hill in Dallas. We set it to music. Enjoy. So far this season (2014-2015), we have had 5.8 inches of snow, which is the highest seasonal total since 2009-2010 (17.1 inches fell that winter). If you remove that total, the next time we had this high a seasonal snow total was 1984-85 with 5.1 inches. The 3.5 inches received at Dallas/Fort Worth International Airport was the 4th highest March snowstorm total. This is the most snow received from a single storm system since Feb. 11-12, 2010. That storm dropped 12.5 inches on DFW. In 2008, we had a total of 2.1 inches of snow in the month of March. Prior to that, the last time we had more than 2 inches of snow in March was in 1962. North Texans help drivers who are stranded after winter weather blasts the area. At 3 p.m., Dallas/Fort Worth International Airport reported 417 canceled departures and 407 canceled arrivals Thursday morning; 242 flights have been delayed. Dallas Love Field officials reported 27 canceled departures and 21 canceled arrivals. Officials also reported 43 delays. As many as 600 travelers were stranded at the airport overnight, airport spokesman David Magana said. At 3 p.m., officials at DFW Airport said operations were returning to normal, five runways were open and roads were wet, but not icy. American Airlines or US Airways customers can reschedule flights by calling the reservations department at 800-433-7300. Southwest Airlines customers can reschedule at southwest.com or by calling 800-435-9792. 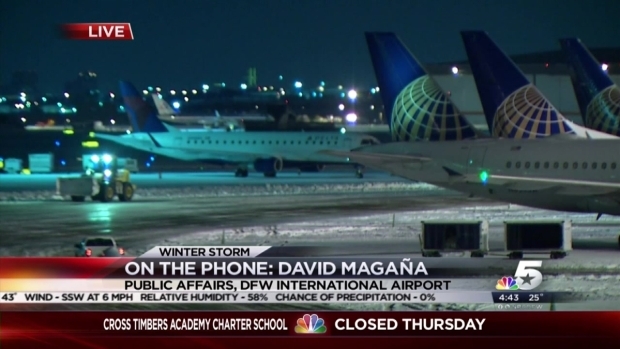 David Magaña with Dallas/Fort Worth International Airport talks weather conditions and airport delays.